Going through a break up isn’t easy. Even the most mutual of breakups have their own pain that comes with it. Putting effort into somebody and seeing the relationship fall apart isn’t fun. It’s heartbreaking, no matter how strong of a person you are. Luckily there’s a song out there that describes exactly how you’re feeling. When words can’t quite explain the ache you feel, know that there’s a song somewhere that will. Music has a way of speaking directly to us in certain situations and heartbreak is one of the most common themes. Only time can truly heal the heartbreak of an ended relationship, but music can certainly help you get through it. You are not alone and you will be happy again, I promise. Below are 14 empowering lyrics that will remind you to stay strong during this post-relationship stage of your life. 1. When you dodged a bullet. In "Best Thing I Never Had," Queen B. talks about how this love will always regret not treating her with the utmost love and respect. Know your worth and never settle. 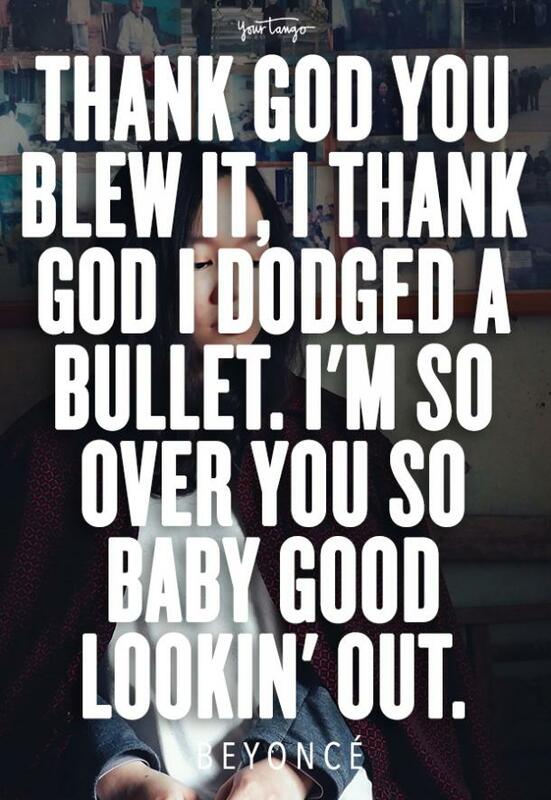 “Thank God you blew it, I thank God I dodged a bullet. I'm so over you so baby good lookin' out.” — Beyoncé, "Best Thing I Never Had"
2. When you get up as quick as you fall. This song is the anthem to loving yourself and not needing anyone else to. Be confident, and secure in your identity to rock out to this song. You don’t need anyone else to validate who you are. 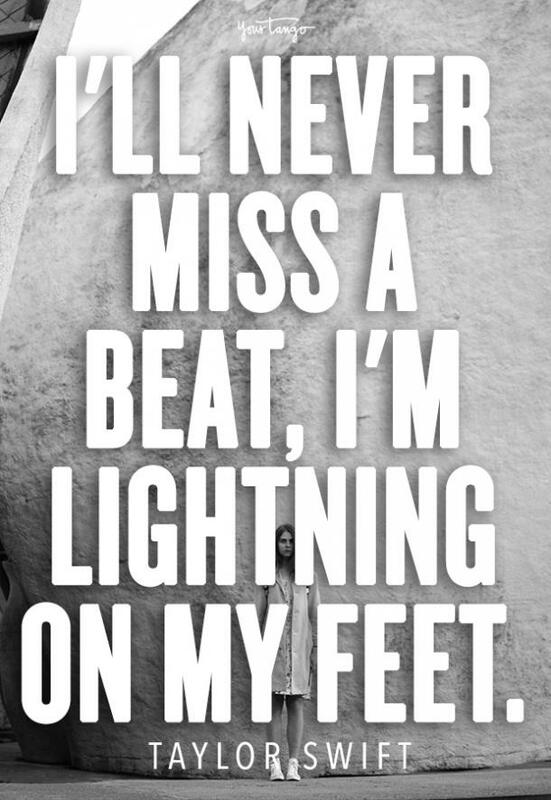 “I'll never miss a beat, I'm lightning on my feet.” — Taylor Swift, "Shake It Off"
3. When you're better off without them. Another throwback featuring Queen B. Destiny’s Child showed up with this single to remind all the single ladies that they don’t need a man who doesn’t value their worth. “Now that you're outta my life, I'm so much better.” — Destiny’s Child, "Survivor"
4. When life is simpler without them. Tell him “boy, bye” because you’ve got one less problem without him in your life. 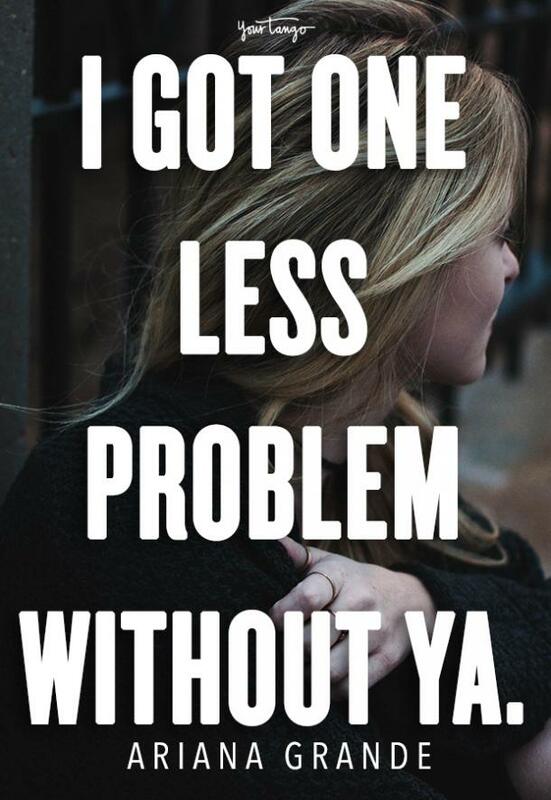 “I got one less problem without ya.” — Ariana Grande ft. Iggy Azalea, "Problem"
5. When you're strong enough to stand tall in the midst of heartache. Nothing can get you down, especially not a boy! 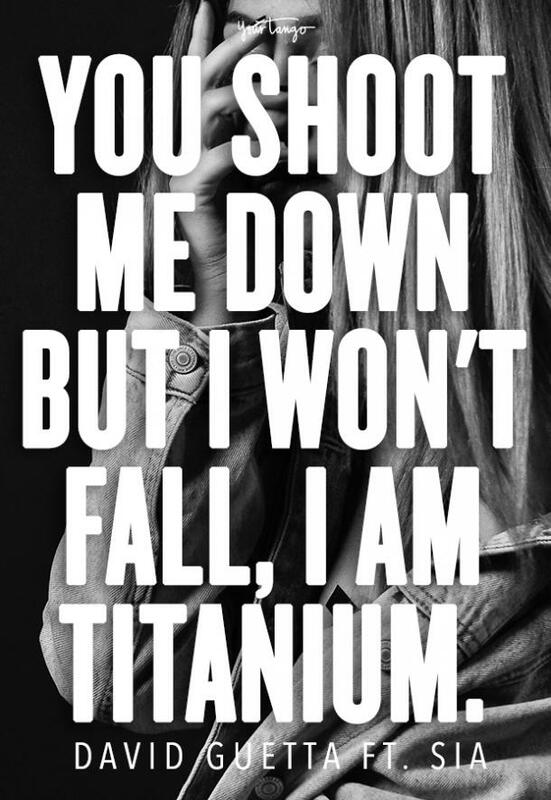 "You shoot me down but I won't fall, I am titanium.” — David Guetta ft. Sia, "Titanium"
6. When you realize they don't deserve your love. It’s the moment you think you won’t get over him but he comes crawling back that you find the strength to move on anyway. 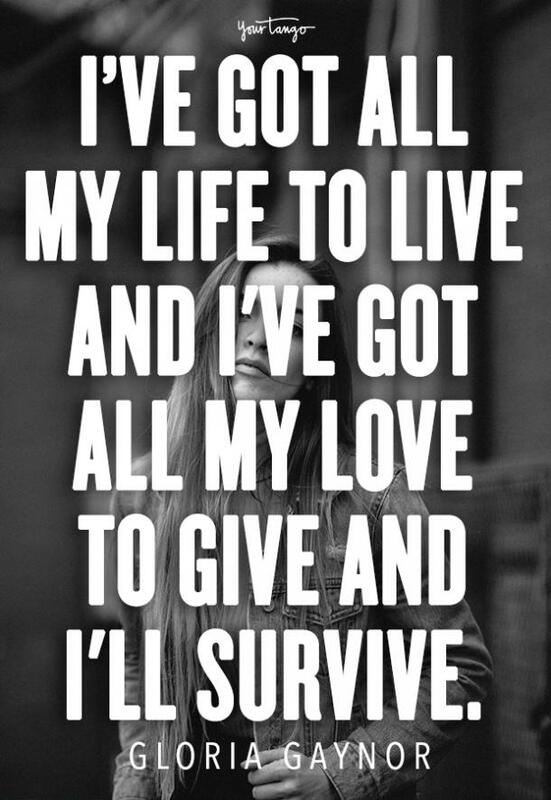 “I’ve got all my life to live and I've got all my love to give and I'll survive.” — Gloria Gaynor, "I Will Survive"
7. When you finally feel free. Clarkson croons about all she’s felt since her partner’s been gone. No more looking back. She recognized her worth and shrugs off the ex like a bad cold and you should, too. 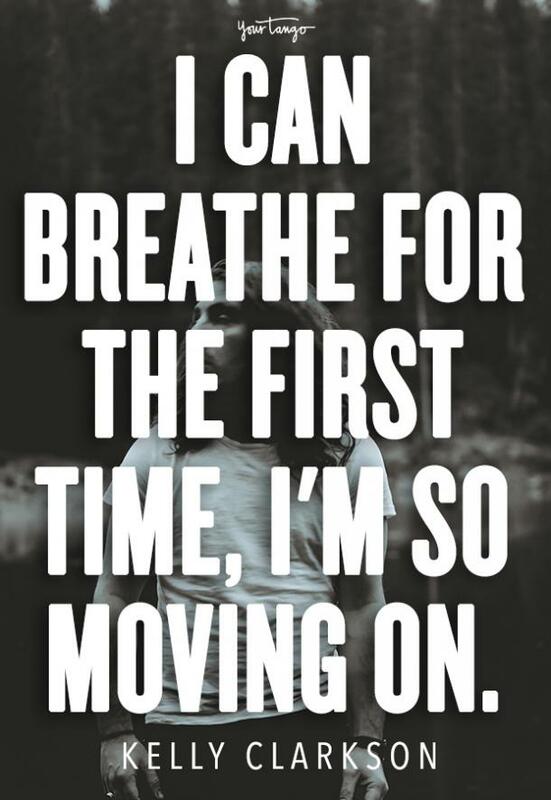 “I can breathe for the first time, I'm so moving on.” — Kelly Clarkson, "Since You Been Gone"
8. When you didn't end well. This is for that one petty moment where all you have to say to your ex can be summed up with one big middle finger. 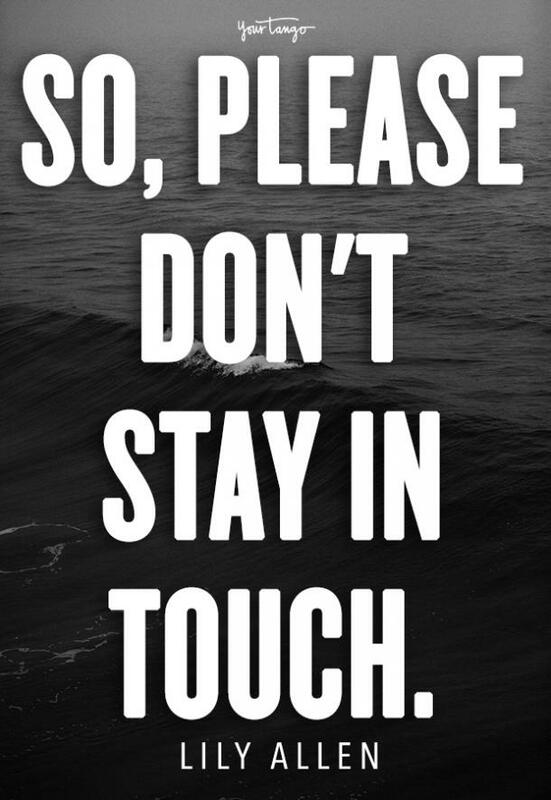 “So, please don't stay in touch.” — Lily Allen, "F*** you (very, very much)"
9. When they did you a favor by breaking your heart. Aguilera reminds us that whatever we've been through made us stronger than we have ever been. "After all that you put me through, you think I'd despise you. But in the end, I wanna thank you, 'cause you've made me that much stronger.” — Christina Aguilera, "Fighter"
10. When independence suits you. Kesha tells us that you can buy your own rings and pay your own bills. Never underestimate the power of being an independent woman. 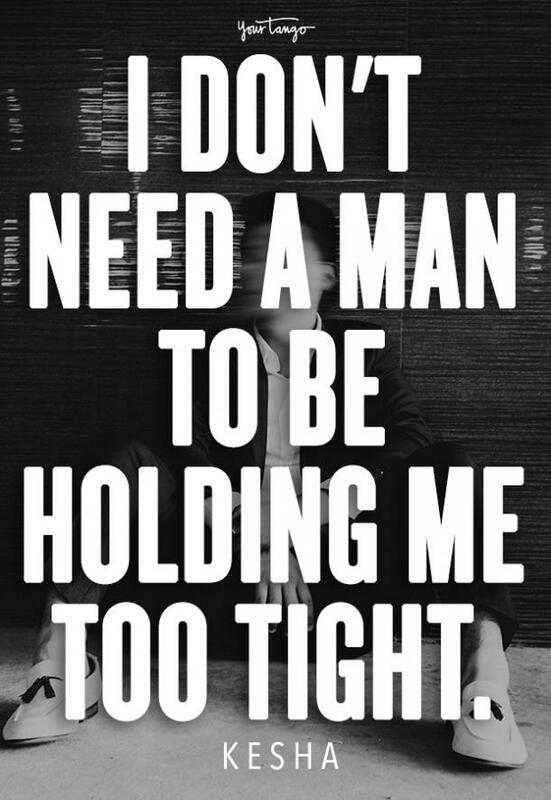 “I don't need a man to be holding me too tight.” — Kesha, "Woman"
11. When you don't need anyone holding you back. You don’t need a man or a woman when you’re a girl who lives life to the fullest. "Live fast, die young, bad do it well.” — M.I.A, "Bad "
12. When you're craving something new and exciting. When you’re bulletproof, nothing can get in your way. Do you and don't worry about your ex — you're onto something new. 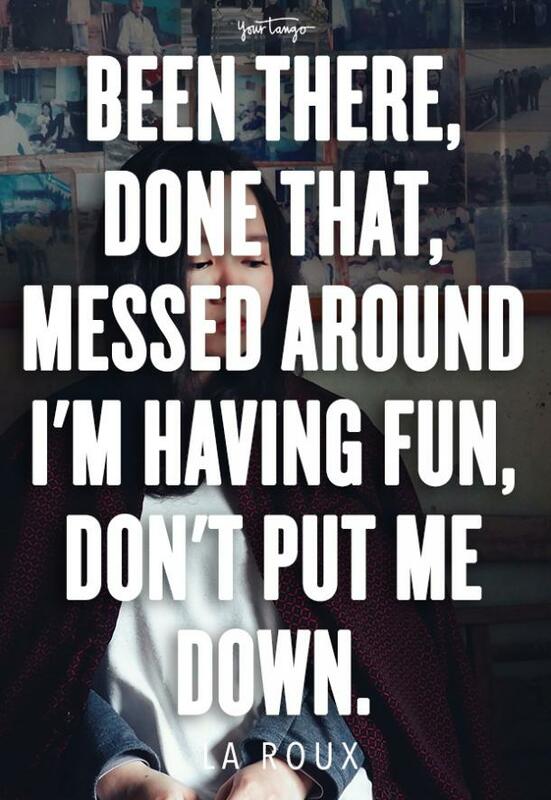 “Been there, done that, messed around I'm having fun, don't put me down.” — La Roux, "Bulletproof"
13. When you're just over it. This anthem reminds us to have fun and to live life for ourselves. Don’t fret about the boy who couldn’t love you right. Just be wild and do the most in your post break up phase. 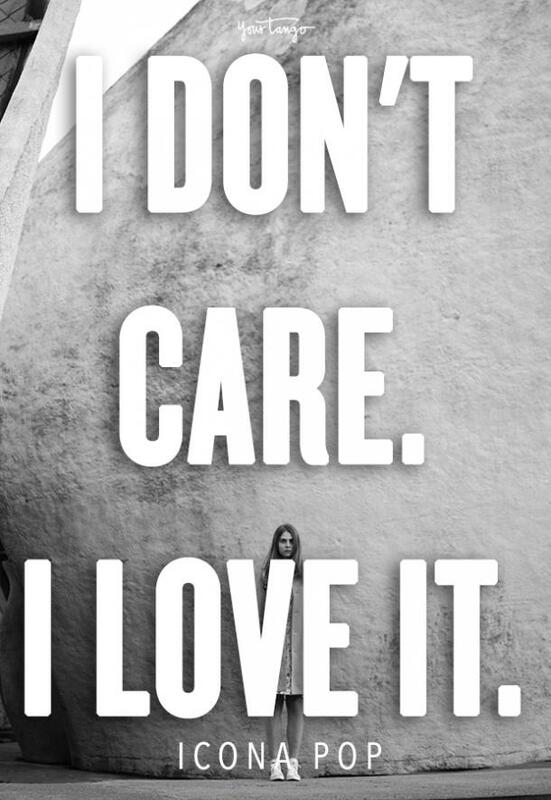 “I DON'T CARE. I LOVE IT.” — Icona Pop ft. Charli XCX, "I Love It"
14. When you're finally feeling yourself again. Fergie reminds us all to leave your insecurities at home and go out, have a little fun and be a little reckless. You got this. “When I come to the club, step aside. 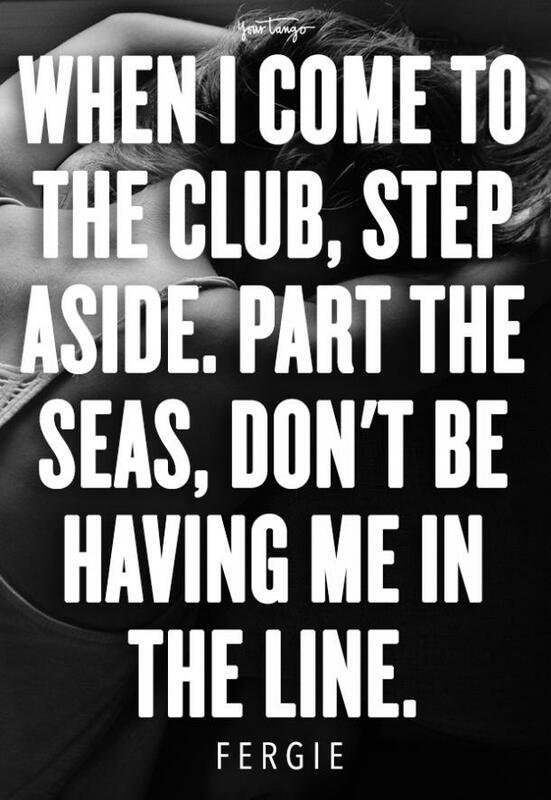 Part the seas, don't be having me in the line.” — Fergie, "London Bridge"